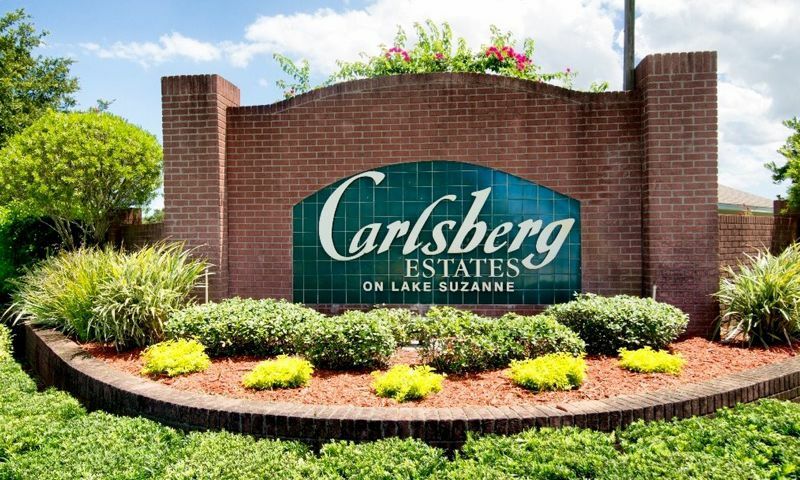 Carlsberg Estates on Lake Suzanne is a 55+ community in Lake Wales, Florida. This gated active adult neighborhood consists of only 162 homes, which allows residents to be a part of a close-knit community and become fast friends with neighbors. Carlsberg Estates on Lake Suzanne provides homeowners with a charming clubhouse and vibrant social lifestyle where they can be as active and involved as they wish. Natural beauty surrounds all homes in this age-restricted community with scenic views of Lake Suzanne. Ideally situated in Central Florida, homeowners are never far from daily necessities and great attractions. Residents have easy access to public transportation, shopping, dining, and entertainment options. Residents gather at the clubhouse where they have access to charming amenities. Here, they can work out in the exercise room to stay healthy. Neighbors can socialize in the multi-purpose room that has billiards and card tables for some fun games. Outdoor, homeowners can take a dip in the pool or lounge on the patio to enjoy the Florida sunshine. They can also take in breathtaking views of the scenic Lake Suzanne on the deck. Residents can get plenty of fresh air by spending time in the natural space or walking along the community's trails. Carlsberg Estates on Lake Suzanne was developed between 1998 and 2006. The community consists of 162 residences that are available on a resale-only basis. An affordable monthly homeowners' association fee includes lawn care, pest control, and access to recreational facilities. Single-family homes in Carlsberg Estates offer approximately 1,134 to 2,456 square feet of living space. They have two or three bedrooms, two or three bathrooms, and an attached two-car garage. These homes typically feature open floor plans, vaulted ceilings, well-equipped kitchens, breakfast nooks, tile or carpet flooring, cabinet spaces, large great rooms, screened lanais, and private backyards. Carlsberg Estates provides homeowners with plenty of activities, clubs, and events for them to stay social and active. An on-site activities director helps plan and organize events and community functions for residents to enjoy. They can attend art classes, charity events, or fundraisers. Fun events like Dogs on the Deck, Drinks on the Deck, Tasty Tuesday, and Flamingo Friday are great ways to meet new neighbors. Residents can join clubs in cribbage, lottery, crafts, CLEOs, or R.O.M.E.O.s to share common interests. With plenty of activities going on in the community, homeowners will never be bored. Conveniently located in Lake Wales, Florida, residents are never far from basic necessities. Carlsberg Estates on Lake Suzanne is situated off of Chalet Suzanne Road, which connects to Highway 27 and makes driving around town quick and easy. Residents have plenty of shopping, entertainment, and dining options at Eagle Ridge Mall, which is a short three-minute drive from the community's gates. Other stores nearby include Kohl's, Lowe's Home Improvement, The Home Depot, and Shoppes on the Ridge. There are several lakes in the area, including Lake Suzanne, that are perfect for water activities or scenic views. Orlando and Tampa are each about an hour's drive away where residents will find more attractions and big-city entertainment as well as international airports in both cities. Carlsberg Estates on Lake Suzanne is a charming 55+ community in a great location within Central Florida. There are plenty of activities available in Carlsberg Estates on Lake Suzanne. Here is a sample of some of the clubs, activities and classes offered here. Single-family homes in Carlsberg Estates offer approximately 1,134 to 2,456 square feet of living space. They have two or three bedrooms, two or three bathrooms, and an attached two-car garage. These homes typically feature open floor plans, vaulted ceilings, well-equipped kitchens, breakfast nook, tile or carpet flooring, cabinet space, large great rooms, screened lanai, and private backyards. Please Note: Floor plans are not available at this time. 55places.com is not affiliated with the developer(s) or homeowners association of Carlsberg Estates on Lake Suzanne. The information you submit is distributed to a 55places.com Partner Agent, who is a licensed real estate agent. The information regarding Carlsberg Estates on Lake Suzanne has not been verified or approved by the developer or homeowners association. Please verify all information prior to purchasing. 55places.com is not responsible for any errors regarding the information displayed on this website.